I’m working on a story for the Crankworx event guide that will attempt to map out the history of freeride mountain biking, to chart a “progression” that took us from the 1976 Repack bike race that burned through everyone’s brakepads, to Greg Watts’ backflip double tailwhip, in 35 years. 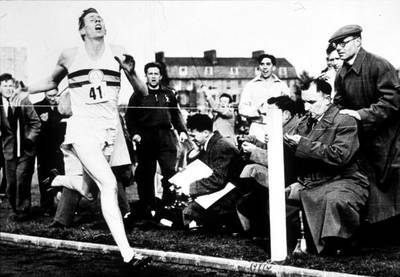 The world record then was four minutes, 1.4 seconds, held by Sweden’s Gunder Haegg. It had been stuck there for nine years, since 1945. It didn’t seem logical to me, as a physiologist/doctor, that if you could run a mile in four minutes, one and a bit seconds, you couldn’t break four minutes. But it had become a psychological as well as a physical barrier. In fact the Australian, John Landy, having done four minutes, two seconds, three times, is reported to have commented, “It’s like a wall.” I couldn’t see the psychological side. That’s how progression works. Psychological barriers get blown apart. The game-changers are the people who explode through the ceiling and next-level the game entirely. I want to try and identify those game-changers for freeride mountain biking. So, to kick things off, I asked a few friends and colleagues, bike-zealots and freeride fanatics, like Mitch Scott, Chris Armstrong, Martin Littlejohn, Leslie Anthony, Ian Dunn, Eric Wight and Dave Watson, to name the most significant moments. I’ve got a list of the top 20 moments compiled – posted here. What’s missing? Whose importance is overstated? Is it possible to come up with a definitive list of THE game-changing moments, riders and events? If we could only rank 10 moments or people, which would be cut out? If we didn’t tell it chronologically, what would be the order of importance?